This is the second in a series about discovering books and reading with my baby daughter Felicity. This is the first of what I’m sure will be many on sharing rhymes and poetry with kids. Rhymes and rhyming poetry are known to be really good for children’s development. There are lots of reasons for this, not least that seeing patterns in words before you can read and write can only help when figuring out phonics later on, and anyone who has sung ‘Hickory, Dickory, Dock’ over and over again (and again and again…) can easily see how much children love repetition and rhythm. So it’s a win win really. I won’t go too much into the background of all this but if you’re interested there is a great page on the Bookstart website going into it in more depth. I was surprised though how early Felicity started responding to poetry. From the age of about two-four months one of her very favourite things was to listen to me or her Dad read some quite complex rhyming poetry. She responded with such glee, and her concentration was totally fixed for quite long periods. Other Mum friends have reported the same experience with their children. She is still enjoying rhyming books at 8 months, but she does also try and eat the book as well so I’m not sure if it’s the rhyming she’s enjoying now or just ‘discovering’ books more generally! I’d really reccomend trying out reading poetry to your young baby, not least because you can do it just from a phone if you don’t have any poetry books or are out and about. Unlike some developmental activities you’re supposed to do reading off my phone felt doable for me as a very tired new Mum. Some absolute classics are Jabberwocky, The Owl and the Pussycat and my favourites, the rhyming poems from Old Possum’s Book of Practical Cats by T.S. Eliot. Alternatively you can use some actual children’s books which can see you through from early babyhood to being school age – I’m keeping the ‘school age’ definition deliberately vague, I’ll find out when we get there when Felicity starts outgrowing things! I’m currently eyeing up the illustrated version of Macavity the Mystery Cat by T.S. Eliot, mentioned above. I’ve loved the Hairy Maclary books since my own childhood, they are so enjoyable to read for adults too. I am too old for Julia Donaldson, author of the fantastic Gruffalo books and Room on the Broom (amongst many others), when I was little but I’m loving discovering them now with Felicity. And the Dr Suess books are obviously such classics that they need no introduction. All have brilliant rhymes and rhythm. It’s quite telling that all these are classics, showing how instinctively the youngest children take to rhyme. 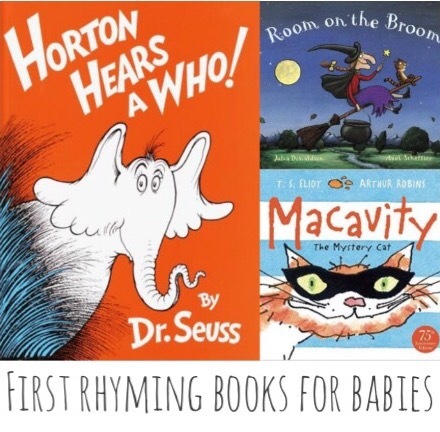 I’m sure part of the attraction for the littlest babies is just listening to an adult talking to them, and for this I found rhyming books like Dr Seuss really good. It’s quite hard trying to find things to talk to a baby about all day, let alone using different and interesting words whilst you’re doing so; especially when massively sleep deprived. It would happily entertain Felicity for a good quarter of an hour if I put her in her bouncy chair and read Horton Hears a Who with a few elephant actions. It requires very little thought and got such a lovely response from her it was a great way to bond. This entry was posted in Reading with Felicity and tagged baby, Books, Children's books, Reading with Felicity. Bookmark the permalink. Matilda loved rhyming books when she was teeny but over the last few months she’s lost interest in anything which doesn’t have interactive bits. Well… other than “Meg and Mog” which I must read about 100 times a day; today I noticed her pointing at Meg’s hat and flipping back and forth to see when it first appears and if it sticks around for the rest of the book – I’m certain she was suddenly twigging that the book has a plot and I’m so excited for her to start caring about stories (and hopefully rediscovering all of those Julia Donaldson books from her baby days).